When you're an avowed anti-Trump person yet have unified a large majority of the entire U.S. population against your expression of Trump hatred, you've accomplished something. Comedian Kathy Griffin has apologized for a photo of herself holding what appears to be a bloody, decapitated fake head of President Trump, despite sweeping bi-partisan disapproval of the image. The photo, taken by celebrity photographer Tyler Shields, was posted by Griffin and Shields Tuesday to their social media accounts. "I caption this 'there was blood coming out of his eyes, blood coming out of his ... wherever,'" Griffin tweeted, referring to an exchange between Donald Trump and former Fox News anchor Megyn Kelly during the primary season. I don't shock easily, but I have to admit I was jarred by that photo of a severed head. I guess it's because it bore a strong resemblance to a head in the aftermath of being decapitated, which was likely the whole point. I have seen online footage of terrorists be-heading America citizens so I'm quite familiar with that gruesome sight of a severed head. To me, the saddest commentary of this whole incident is how pleasantly surprised political righties (myself included) were in that even the most ardent anti-Trump voices unequivocally condemned Griffin's actions. The reason that's sad is because too many people have become so jaded by political discourse that we almost don't expect there to be a minimum standard of decorum. However, the fact there is a "bridge too far" for leftists is oddly refreshing. Nevertheless, there are likely some who will brush this off as part of "the new normal" in political discourse. If you're one of those people, then Benny Johnson of Independent Journal Review has some things to share. Do you think this photo is OK? Fine. Lets talk through a few things. I don't typically play the 'Imagine if a Republican Did This' game, but it's becoming harder & harder to take people seriously. Consider what would happen if a Emmy & Grammy award-winning celebrity, who is also a part-time CNN commentator, posed proudly with a bloody, decapitated head of Obama 130 days into his Presidency? The levels of existential meltdowns & garment tearing inside the chattering-class would reach Defcon 10. Shame. Firing. Banishment. Loss of future, just to start. And it would be rightly deserved. The act of glorifying a President's decapitation should make the most rock-ribbed partisans recoil in horror, because... decency. Let's say you disagree with me & you think President Trump deserves this. Can you at least admit that the President is a human & this dehumanizes him on a level that is dangerous? Like, glorifying his death. You know, Trump has a 11 year-old son? Would you wish *anyone's* innocent 11 year-old to see the dramatization of their parent's beheading? Oh, you still think it's fine? Ok, forget Trump. On the very basic, human level, can we agree that a handful of *Americans* have been actually, publicly decapitated at the hands of ISIS on YouTube in very recent memory? Not to mention countless of thousands of other Christians & Muslims alike. So to glorify the barbaric action is perhaps disrespectful to the dead? Still don't agree with me? Can you name one thing this does to help our political discourse, like, even a little bit? You can't because, like much of our dialogue, this is intended to raise the stakes. It's intended to inflame Trump supporters & make them seethe. It's intended to disgrace the office of the Presidency & dehumanize the person who holds it. If you support it, you're a bad person & you're playing a dangerous game with our democracy. There's no question that President Trump has said some things which in and of itself diminish the office of the Presidency. But as long as his detractors engage in this kind of discourse, Trump will continue to gain the high ground by default. It really is a vicious cycle. In what is the final biennium budget he will see as Minnesota governor, Little Lord Fauntleroy Mark Dayton still had to make a scene. Oh sure, he went ahead and signed off on the $46 billion budget passed by the Legislature last week. But the tax relief bill? Well, that's a little more complicated. Dayton also said he would allow a tax relief package to become law without his signature, but chastised Republican lawmakers for adding what he called a "poison pill" provision to the bill that would have eliminated all Minnesota Department of Revenue funding if it were killed, a move the governor described as a "reprehensible sneak attack." In response, Dayton used his power to eliminate spending for the House and Senate. The gravity of that move wasn't immediately clear but it's certain to trigger a confrontation with GOP legislative leaders. When asked about slashing legislative funding, Dayton told reporters, "Well, they can come back and get it restored .... we'll find out how much money they have stashed away" in reserve accounts. 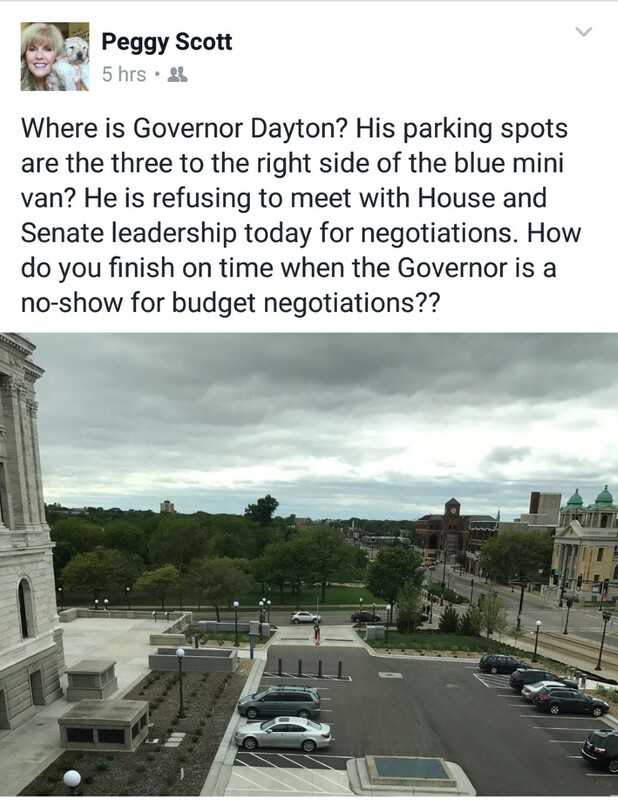 So is Dayton implying the MN Legislature can have it's funding restored only if they come back to the table to re-work terms of the tax relief package? Seems to me the textbook definition of "extortion," no? The reason I emphasized the phrase "Dayton used his power" is because it appears that isn't Dayton's "power" to wield according to Harry Niska, a GOP candidate for MN Attorney General. Governor Dayton's line-item veto of the entire budget for the Legislature is a blatant violation of the constitutional principle of separation of powers. In fact, this is the quintessential example a law professor could use to demonstrate the concept: one branch cannot eliminate another branch simply because it disagrees with the decisions of that branch. So how did the leading DFL candidate respond to this blatantly unconstitutional, partisan act? By lauding it as a "brilliant move." This is why I'm running. The Attorney General must be someone who defends the Constitution, not someone who revels in the unconstitutional actions taken by their allies. We need an Attorney General who enforces and upholds the law for all Minnesotans. So the "leading DFL candidate" for MN AG is a guy who in 2013 referred to a black U.S. Supreme Court justice as an "Uncle Thomas?" Brave new world. Does this mean another special session of the Legislature is pending? Maybe a lawsuit claiming Dayton violated the Separation of Powers? I don't know. But I definitely have some popcorn poppin'. When it comes to holidays celebrating America or faith or.....well, let's face it. Leftists politicize any holiday, regardless of its significance. I think Stephen Miller of HeatStreet had it right when he suggested a certain meeting. It seems only logical to select a game from a Memorial Day past. On May 28, 1973, the Cleveland Indians visited the Chicago White Sox. White Sox pitcher Wilbur Wood pitched a four-hit shutout for the Sox this day. Sure, that's impressive. But what makes it even more astonishing is he pitched five innings earlier that day (and also got the win) in the completion of the previous Saturday's suspended game. It's the Sunday before Memorial Day but we'll be live today on the Northern Alliance Radio Network. Yes, the one-hour bonanza known as The Closer will begin at 2:00 PM Central Time. In what was a busy news week, I will definitely look back at the horrific terrorist attack in Manchester, England. I will also weigh in on the special U.S. House election in Montana. At 2:30 I will be joined by Jason Flohrs, who is the State Director at the Minnesota chapter of Americans for Prosperity. We'll discuss the latest Minnesota legislative session as well as myriad issues taking place at the Federal level. After Thursday evening, the Democrat party is still longing for that elusive special election victory which proves there's a backlash against President Donald Trump, or something. Just 24 hours after being charged with assault for allegedly body-slamming a reporter in his Bozeman campaign office, Republican Greg Gianforte on Thursday defeated Democratic opponent Rob Quist to win the special election for the U.S. House seat in Montana. The race was thrust into the national spotlight in dramatic fashion on Wednesday night after Guardian reporter Ben Jacobs described being "body-slammed" by the GOP candidate, and a Fox News crew who witnessed the incident said the former technology and software executive "grabbed Jacobs by the neck with both hands and slammed him into the ground behind him." To be clear, this isn't something Republicans should necessarily be celebrating. Short of defending himself, Gianforte had zero reason to put his hands on someone with the intent to cause harm. As such, he did apologize for his actions upon declaring victory. "When you make a mistake you have to own up to it, that's the Montana way," Gianforte said. "Last night I made a mistake... That's not the person I am and it's not the way I'll lead in this state." "Rest assured, our work is just beginning, but it does begin with me taking responsibility for my own actions," he added. "You deserve a congressman who stays out of the limelight and just gets the job done." Also, I'm not really interested in the shrieking leftists and their sudden discovery of a moral compass when it comes to violence towards political opponents. Unless these same people are willing to unequivocally condemn multiple violent protests by leftist kooks in Berkeley, St. Paul, etc., they have no credibility whatsoever in expressing outrage over Gianforte's excessive actions. But hey, if anyone is willing to start a movement to kick out members of Congress who have at some point in their lives body-slammed someone with whom they had a political beef, I'm all ears! - When a political candidate makes a verbal faux pas during a campaign, there can occasionally be room for nuance or an opportunity to provide further context. But when a candidate commits a physical act of aggression towards a media member in front of witnesses? Not a lot of room for interpretation. Greg Gianforte, the Republican candidate for a special House election in Montana, was officially charged with assaulting a journalist on Wednesday — just one day before the election. As The Guardian reporter Ben Jacobs attempted to ask Gianforte a question about the recently released Congressional Budget Office cost estimate of the House GOP’s health care legislation, Gianforte grabbed Jacobs by the neck and slammed him to the ground, according to Fox News’ eyewitness account. The Gallatin County Sheriff’s Office cited Gianforte with a misdemeanor assault. He must appear in court by June 7, a county clerk told Fox News. This is Montana's only U.S. House seat, one which has not had a Democrat representing it in more than 20 years. Since leftists are so desperate for an electoral repudiation of President Donald Trump, they may well get it in Montana by default. But if Gianforte is elected, the next question is will the GOP House caucus goes ahead and seat him without incident. While Speaker Paul Ryan has condemned the incident and insists that Gianforte apologize, he essentially said he would abide by the will of the Montana voters. It is only in this current political climate that Montana is the epicenter of national political news. Heck, that was likely the case before this latest incident. - After being a proverbial church mouse for eight years, Sen. Al Franken (D-MN) feels emboldened now that he is in the minority party in Washington. His criticism of President Trump combined with aggressive questioning of Trump judicial & cabinet nominees has caused his star to rise among Dems desperate for a viable presidential candidate in 2020. However, Sen. Fart Joke Franken is, at this time, not interested. The Minnesota Democrat has been among several high-profile Democrats seen as likely candidates. But in an interview with People Magazine, the former comedian ruled out a run. “I got way, way, way too much to do right now to even think about that, other than to say, ‘No, I’m not going to do that,'” Franken told the magazine. - So how about the first place Minnesota Twins?! Yes I realize we're barely past the one-quarter mark of the season, but the Twins have (for now) defied low expectations after a franchise worst 103 losses in 2016. And while I don't expect the Twins to ultimately win the American League Central Division this year (the defending A.L. champion Cleveland Indians are still loaded), they have definitely identified some core players which could provide long term success. Third baseman Miguel Sano is having an MVP caliber season as he is tied for A.L. lead in RBIs and is top 10 in home runs and batting average. According to normally understated former Twins manager Tom Kelly, Center Fielder Byron Buxton is the fastest baseball player he's ever seen. While he's off to a slow start at the plate, Buxton more than makes up for it in the field. But the latest phenom which is garnering significant attention is starting pitcher Jose Berrios. Berrios has been downright filthy in his first three starts, winning all three while compiling a 1.66 Earned Run Average, a minuscule 0.55 Walks and Hits per Inning Pitched (WHIP) and a downright stingy .111 opponents' batting average. Not since the peak years of Johan Santana (2004-06 when he won two A.L. Cy Young awards) or perhaps the 2006 version of Francisco Liriano have Twins fans marked their calendars for a game in which a specific starting pitcher toils. Even if the Twins fall short of a postseason berth, it's no small consolation that the core of their current roster is young, talented and already providing significant contributions. For the first time in about six years, it's definitely OK to be excited about the direction of this franchise. 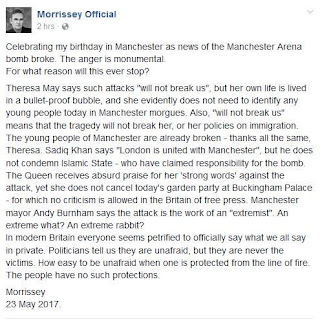 Let's take a gander at two separate responses to the Monday terrorist attack at the Ariana Grande concert in Manchester, England. My friend Bryan Strawser has said on more than one occasion that "The war is here, and it doesn't really care if you want to be a part of it." On Monday evening we received yet another chilling reminder. Police say 19 people are confirmed dead and around 50 others are injured following reports of an explosion Monday night at an Ariana Grande concert in Manchester, England. Chief Constable of Greater Manchester Police Ian Hopkins held a late press conference and said that they are currently treating the explosion at Manchester Arena as a "terrorist incident" until they have further information. "This is a very concerning time for everyone," Hopkins said. He also said that further details would be released when they have a clearer picture. As you can imagine, Ms. Grande was devastated by this incident. Sadly, a fair number of responses to this tweet were people reminding Grande of her unflattering comments about America, her anti-Trump stance, her sympathy for Muslim refugees, etc. To conjure up those issues in light of the awful atrocities at one of her concerts is just disgusting and downright cruel. Don't be one of those people, k? Admittedly I wasn't at all familiar with Grande's style of music but from what I understand, she largely appeals to teenagers. So whatever soulless ghouls carried out this attack knew darn well that a lot of kids would be in attendance at that concert. Not only was the venue significant, so was the date of May 22. Just as it was no coincidence that the Benghazi terror attack occurred on the 11th anniversary of the 9/11/01 attacks on U.S. soil. Naturally there's a lot of information still flowing at this point, but early indications are a homemade bomb was detonated by a suicide bomber. The device was described as one of those "nail bombs" similar to what was used in the Brussels attack last year. Perhaps one of the more disturbing aspects of this attack (and something Strawser has also alluded to before) is that it was another "soft target." That is, people are essentially preoccupied and thus very vulnerable to harm, just like in Nice, France last year when people were wrapped up in Bastille Day festivities or December 2015 in San Bernardino, CA where employees were enjoying a Christmas party. It would seem to me that if one of the goals of terrorists is to have people of the western world skittish about merely living everyday life, the incidents which have occurred over the past few years have gone a long way to accomplishing that. The St. Louis Browns (who eventually became the Baltimore Orioles) took on the Boston Red Sox in the first game of a doubleheader on September 29, 1943. The Browns' Vern Stephens hit a home run in the 11th inning as well as the 13th inning in this game, meaning he became the first player in MLB history to hit multiple homers in extra innings. A lot to get to in this week's edition of The Closer. The one hour festivities get kicked off at 2:00 PM Central Time. There was definitely a ton of news coming out of the White House this past week, but is there any "there" there? Also, are any progressives really considering the consequences of what would happen if indeed President Donald Trump is forced to leave office? I'll also look back at some examples of what happens when certain constituencies that leftists believe they own don't toe the progressive ideological line. In 2011, Gov. Mark Dayton agreed in principle to a biennium budget compiled by the all GOP Legislature, only to inexplicably walk away from the deal at the 11th hour. When regular session expired, it was Dayton's purview as governor to call a special session. He refused, thus government shut down after the June 30th deadline expired. 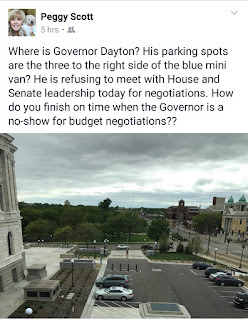 When Dayton went on a state wide demagoguery tour in July to throw the GOP under the bus, much of the public's reply was basically "Oh, government is shut down?" After a nearly three-week shutdown, Dayton essentially agreed to the same budget which he refused to sign before the end of regular session. In 2015, the Minnesota Legislature was comprised of a Democrat majority in the Senate and a GOP majority in the House. Of the 201 legislators, 91 Republicans and 32 Democrats agreed to a biennium budget which didn't include Gov. Dayton's unreasonable request for massive Pre-K funding. Despite the bipartisan agreement in the Legislature, Dayton once again vetoed the budget and the regular session ended. But this time a special session was called, yet Dayton was rebuffed when striving for the aforementioned Pre-K funding. He eventually abandoned his demand and signed essentially the same budget he refused to agree to prior to the end of regular session. So with 2017 being another budget year and scheduled end of sessions being slated for Monday, Gov. Dayton certainly wants to avoid another embarrassing setback, right? No doubt he's willing to sleep at the Capitol building to ensure he and the Legislature can have this budget all buttoned up by the end of the weekend, right? Hold firm, Republicans. Moments like these are exactly why you were given back a majority in the Legislature. True, Hillary Clinton's gross negligence in handling classified information while serving as Secretary of State should have been met with criminal charges. And true, a sitting President of the United States has the purview to declassify any classified information. But does that mean we should just turn a blind eye to what President Donald Trump himself admitted he told Russian officials in an Oval Office meeting last week? Not according to Sen. John McCain, who knows a thing or two about protecting sensitive information at all costs. “The reports that the President shared sensitive intelligence with Russian officials are deeply disturbing. Reports that this information was provided by a U.S. ally and shared without its knowledge sends a troubling signal to America’s allies and partners around the world and may impair their willingness to share intelligence with us in the future. Regrettably, the time President Trump spent sharing sensitive information with the Russians was time he did not spend focusing on Russia’s aggressive behavior, including its interference in American and European elections, its illegal invasion of Ukraine and annexation of Crimea, its other destabilizing activities across Europe, and the slaughter of innocent civilians and targeting of hospitals in Syria. "I continue to believe that we need a select congressional committee to fully investigate Russia’s interference in the 2016 election. Sanctions – not intelligence-sharing – should be our course of action." As usual, this episode was largely sensationalized by an overzealous media committed to taking down who they feel is an illegitimate president. However, to dismiss this as a "nothing burger" would also be a mistake. Which brings me to yet another explosive allegation levied towards Trump. James Comey, the recently fired FBI director, was asked by President Donald Trump to end an investigation into the actions of former national security adviser Michael Flynn, according to a memo Comey wrote about his conversation with the president, a source close to the former director confirmed to ABC News. The New York Times was the first to report the discussion and subsequent memo Tuesday. In the memo, which Comey shared with top FBI associates, the former director wrote that Trump said, "I hope you can let this go," in relation to the inquiry into Flynn's actions. ABC News has not seen the memo and Comey has not commented on the matter. Multiple sources who have worked closely with the former director, including within the Justice Department, say Comey is known for his fastidious notetaking. "He documents everything," one source said. If indeed this allegation is true, I don't see how Trump can survive his first term. But if no such memo can be substantiated? Seems to me that the New York Times' credibility would take a sever.....BWAHAHAHAHAHAHA!!! Oh, I almost was able to say that with a straight face. Yes, the Times' credibility has long since been in the proverbial crapper, so they figure they can implement a throw-against-the-wall-and-see-what-sticks strategy. Thankfully, it didn't take long for the Times' bluff to be called. On Tuesday evening, Rep. Jason Chaffetz, R-Utah, the chair of the House Oversight Committee, sent a letter to McCabe requesting that the FBI provide "all memoranda, notes, summaries, and recordings referring or relating to any communications between Comey and the President" by May 24. Earlier in the night, Chaffetz tweeted that he has his "subpoena pen ready." There's no doubt that the "resistance"crowd is gleefully rubbing their collective hands together over these latest developments, which makes me wonder if they're even considering what would happen if Trump is drummed out of office. Remember, many on the left desperately wanted a candidate Trump, believing that would be the easiest path to victory for Hillary Clinton. They didn't appear to stop and think for one second what would happen if Trump prevailed. Now that there's a slight possibility Trump may be toast? They apparently aren't fathoming a President Mike Pence. You think proggies are losing their s**t now?!?! Hoo boy. But hey, enjoy your perceived schadenfreude, leftists. "We advocate for you.....so long as you're in lockstep with our ideology"
American liberalism’s reaction to one of “their”constituents – women, gays or people of color – running for office or otherwise identifying as a conservative is indistinguishable from sociopathic disorder. With that in mind, I point you to an immigrant (born in Italy) black woman who is also a scientist working for an independent agency of the U.S. government. The only way leftists could concoct a more ideal constituent in their minds is if said woman was a male identifying as a female. So can you imagine the veritable freak out in proggie circles when a young, immigrant black woman scientist employed by the government doesn't exactly utter leftist chanting points? I'd like to introduce you to Kara McCullough, who was crowned Miss USA Sunday evening. Both The Washington Free Beacon and Twitchy did a nice job in documenting the backlash. The Miss USA system falls under the umbrella of Miss Universe, which touts its organization as "a company run by women for women, built on a foundation of inclusion and continues to be a celebration of diversity." 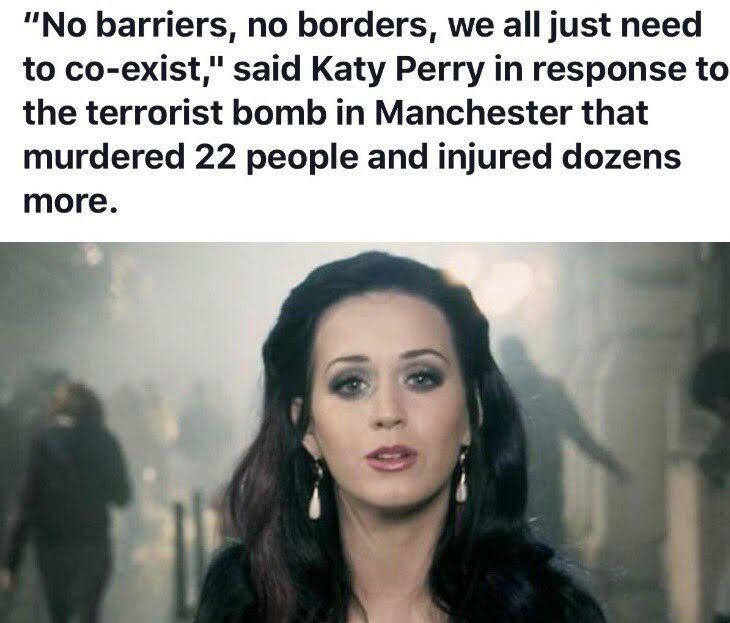 It's a shame that much of the public at large doesn't embrace diversity of thought. Yes, nothing says "women's empowerment" like the expectation to be in lockstep with one specific ideology. New York Yankees legend Derek Jeter had his jersey number retired Sunday evening. With that in mind, let's look at a game which featured one of his many memorable moments. It was in a 2004 contest against the hated Boston Red Sox. With no regard for his physical well being, Jeter makes an incredible catch in shallow left field. It's also a beautiful Sunday to be outside and have the radio tuned in to AM 1280 (or The Patriot being streamed on your favorite mobile device) for today's edition of The Closer. As always. we'll get started at 2:00 PM Central Time. The Minnesota legislative session is close to wrapping up, which means Gov. Mark Dayton (especially in a budget year) becomes especially erratic and unreasonable. I will also discuss the latest in the 2018 MN gubernatorial race which thankfully will not include Dayton. At 2:30, I will discuss with political wonk Matt Mackowiak the bizarre aftermath of FBI Director James Comey's firing. Just a "heads up," I will be filling in for Paul Ridgeway this evening on his daily radio program On The Way. I will be on from 4:00 until 6:00 Central Time. Among the topics I plan on addressing include the claim that opposing Obamacare is "non-Christian." Since I host a political talk show every week, I will likely conjure up other topics where faith and politics intersect. Then at 5:00 I will speak with Jeff Gilbert, who is an ambassador with the organization Save the Storks. The mission of STS is to "partner with pregnancy resource centers and give abortion-vulnerable women a choice that will change their lives forever." A familiar name is jumping into the 2018 Minnesota gubernatorial race. Republican Jeff Johnson is vying again for the seat Democratic Gov. Mark Dayton kept him from winning in 2014. The Hennepin County commissioner — who won 45 percent of the vote to Dayton’s 50 percent last time — hit a populist message announcing Wednesday morning that he will run for governor again in 2018. That message might have been more effective had it been used against Dayton in 2014. And therein lies one of myriad issues which plagued the Johnson campaign. For whatever reason, there was never a consistent message to effectively hit what was a vulnerable incumbent. However, having run in two statewide races in the previous 12 years (Attorney General in 2006; governor in 2014), Johnson sees that as a decided advantage over the other GOP candidates. “The Republicans who are going to make this decision know what to expect from me, know how hard I will work, know I won’t wilt under the pressure,” he said. While all that may be true, the big hangup many astute observers had was that Johnson didn't work smart. His campaign seemed to lack focus at times as well as having a support staff which seemed out of their league in terms of running a race of this magnitude. “I know what I did really well and I know where I fell down, and we need to do much better,” Johnson said. This time, unlike last time, he will offer policy specifics during his run. His campaign three years ago was long on generalities and offer fewer policy proposals. I like Johnson personally and enthusiastically supported him in 2014 once my preferred gov candidate (Dave Thompson) dropped out upon not securing the Minnesota GOP endorsement. Let's just say I'm still keeping my options wide open. Say what you will about President Donald Trump, one thing he's not is (for better or worse) indecisive. Speculation abounds as to the timing of this move and more information will likely trickle out in the coming days, weeks and months. - Comey's decision last July to not charge Hillary Clinton for what many legal minds believe was gross negligence regarding her private email server was rumored to have angered many agents within the Bureau. With that in mind, perhaps this firing was long overdue given that Comey's leadership was severely questioned/disrespected by his subordinates. - Comey's relationship with the Bureau was further in peril when it was revealed he gave inaccurate testimony in reference to Clinton top aide Huma Abedin's handling of classified emails. This resulted in the FBI issuing a supplemental report to Comey's statement. - Since Mrs. Clinton lost the election, many leftists (including Clinton herself) laid much of the responsibility for the loss at Comey's feet given he "re-opened" the investigation into her email practices a mere 11 days before Election Day. Any other day, proggies would be dancing on Comey's proverbial grave for getting (in their minds anyways) his just due. Ah, but since Comey was in the midst of offering testimony before the Senate Judiciary Committee regarding outside interference into this past November's election, leftist conspiracy theorists say Trump is trying to bury any evidence of Russia ties, thus there being some leftist sympathy for Comey. But given the individual who will be the interim FBI director (hint: someone with indirect ties to Clinton), that theory is utterly vacuous. I'm speaking particularly to the anti-Trump crowd on the left. Before Donald Trump became the official Republican nominee for President in the summer of 2016, I know a good number of y'all were secretly hoping (if not downright advocating) for him to be the GOP's presidential candidate. Believe me, I understand your logic. Of the top tier GOP candidates (specifically Trump, Ted Cruz, Marco Rubio and John Kasich), Trump by far polled the worst in a head-to-head matchup with Hillary Clinton. You wanted the easiest path to victory for your candidate, so you no doubt believed you had it upon Trump receiving the official GOP nod in July. Meanwhile, there were many right-of-center politicos like myself who, for a full year, were pulling out all the stops to prevent Trump from becoming our nominee. It was inexplicable to us how anyone could listen to Trump's feckless meandering and thus consider him to be a legit presidential candidate. But against our strenuous objections (and because the GOP doesn't have the defense mechanism of "super delegates" like you Dems), Trump was able to steam roll through to the nomination. While some anti-Trump folks on the right were willing to don a HazMat suit on Election Day and cast a ballot for him, others either wrote in a different candidate or abstained from voting for president altogether. Why am I bringing all this up now? Simple. A lot of lefties on Twitter often reply to my politically charged tweets with snark (and sometimes downright nastiness) because I am a conservative. The typical tone indicates that leftists assume I'm a Trump apologist. So for those of you leftists who are going to be nasty towards right-of-center folks because the president you abhor has an "R" next to his name: A lot of you are more responsible than people like myself for Trump being where he is today. Arizona Diamondbacks at San Diego Padres - July 18, 2001. This game was suspended after only two innings, resuming the next day. Diamondbacks pitcher Randy Johnson came on in "relief" of starter Curt Schilling in the third inning and ended up striking out 16 Padres over the game's final seven innings. The 16 Ks is an MLB record for a relief pitcher, a record which will likely never be broken. What an insanely busy news week. Once again, I will be tasked with trying to fit in as much as possible on this week's edition of The Closer. The one-hour broadcast gets going at 2:00 PM Central Time. I'll definitely look back at the week where two different late night TV "entertainment" hosts pulled out the big guns in political hackery/demagoguery. At 2:30 I will be speaking with Bill Poehler, who is Communications Director with Minnesota Concerned Citizens for Life. Mr. Poehler will be on to discuss two separate pro-life bills working their way through the MN Legislature. - A certain daytime TV gal was on a whirlwind media tour this past week in commemoration of her 20-year anniversary of "coming out." Inevitably, she was asked about the President of the United States. Freedom of association is a wonderful thing, isn't it? I mean, isn't it awesome to live in a country where the government cannot coerce someone into unwanted interactions? Thanks for standing on principle, Ellen! - The headline for this story definitely stood out. Popeyes manager arrested for allegedly dipping chicken in cocaine based flour to increase business sales. I'm certainly no expert but isn't cocaine rather pricey? I ask because how much more chicken would this Popeyes have to sell to justify the high costs associated with making coke-laced batches? - In the last unemployment report before the 2012 presidential election, it was reported that September 2012's rate dropped to 7.8%. That was significant because it had marked the first time in several months it had dipped below 8%. Naturally the Obama administration touted this milestone as one of the reasons the President deserved reelection, which of course he received shortly thereafter. One of the more frustrating aspects of the eight years of economic reporting under Obama is the U-6 unemployment rate was rarely (if ever) promoted. This particular measurable factors in part time workers who desire to work full-time but are unable to do so, those who are working in jobs for which they are well overqualified but desire opportunities within their field of expertise, etc. But since the mainstream media stooped to touch the hem of Obama's garment had a largely favorable view of Obama, reporting such stats would have reflected poorly on his administration's economic record since the U6 was consistently in the double digits. Ah, but I have great news, folks! After being conspicuously absent for 8+ years, the U6 is back y'all!! The official unemployment rate is defined as "total unemployed, as a percent of the civilian labor force," but doesn't include a number of employment situations in which workers may find themselves. The U-6 rate is defined as all unemployed, plus "persons marginally attached to the workforce, plus total employed part time for economic reasons, as a percent of the labor force." Welcome back, U6!! I hope your recovery is matched by economic resurrections over the next several years. Did you see the look on House Minority Leader Nancy Pelosi's face when the American Health Care Act (AHCA) passed the House on Thursday? Well, given the multiple botox injections, it's hard to know what she's really thinking by her facial expressions alone. Anyhow, yes, the AHCA passed the House without a single Democrat vote because "RESIST" or something. In all seriousness though, I'm having a hard time grasping why there's such exhilaration on one side and utter freak outs on the other. I say that because this current version of the AHCA is essentially dead on arrival at the U.S. Senate. If indeed there ends up being some massive overhaul of health care, the final legislation will likely appear vastly different from the current House version. Avik Roy at Forbes analyzes the paths the Senate could take. A working group of a dozen GOP senators, derived from the key Senate health care committees—Finance; Health, Education, Labor, and Pensions; and Budget—has been meeting for weeks to contemplate how the Senate should proceed. That could be a good thing or a bad thing. The best-case scenario is that the Senate builds on the House’s Medicaid reforms while replacing the Ryancare tax credits with a more means-tested version. One worst-case scenario is that the Senate simply waters down the reforms in the House bill for a result much closer to the status quo. Another worst-case scenario would be for the Senate to pass the House bill as is. That bill, if it were enacted into law, would price millions of lower-income Americans out of their coverage. Not only would that policy result threaten GOP majorities in Congress and across the country, it would damage the credibility of free-market health reforms for a generation. We’ll know soon enough which path the Senate has chosen. I'm normally not very optimistic of meaningful reforms taking place when Republicans have control of all levers of power in Washington. However, Senate Majority Leader Mitch McConnell surprised a lot of us on the right with his bold stance in the battle for Justice Antonin Scalia's vacant Supreme Court seat. Does McConnell and the GOP Senate caucus have one more big surprise in them? I'll believe it when I see it. FBI Director James Comey testified before the Senate Judiciary Committee Wednesday regarding outside interference into the 2016 presidential election. This was fresh in many Americans' minds due to failed candidate Hillary Clinton earlier this week citing Comey's announcement 11 days ahead of Election Day that he was looking into further irregularities in her email practices. As such, Mrs. Clinton believes that was a factor in her defeat. When Comey informed Congress in late October that he was looking into additional issues, he specifically referred to Clinton's top aide, Huma Abedin, as having mishandled classified information. Apparently Abedin had forwarded classified emails to her husband (and serial pervert) Anthony Weiner to print out physical copies. But like his decision not to charge Clinton for what appeared to be violations of Federal statutes, Comey also declined to pursue charges against Abedin since she had no "criminal intent." While that may have been true in both instances, there is a statute which addresses gross negligence being a crime, regardless of intent. National Review's David French was downright incredulous over this. This is stunning. Just stunning. As I’ve written before, I served in the military, handled classified information, and helped investigate possible violations of laws and regulations governing classified documents. Here’s what I know beyond a shadow of a doubt — if a soldier had sent classified documents to his wife “to print out,” his best legal outcome would be a one-way ticket to a dishonorable discharge. His worst outcome would be jail. Let’s not forget, Hillary and her entire team (including Abedin) were bound by law to protect both marked and unmarked classified information. Moreover, Hillary and her entire team were hardly neophytes. They’d been exposed to classified information for years. They knew exactly the types and categories of information that were typically classified, and they knew how they should handle that information. But Abedin forwarded e-mails for printing anyway. But Hillary stored messages on her homebrew server anyway. No wonder Hillary lied so loudly and frequently about her e-mails. The truth was too devastating (and incriminating) to tell. I still don’t understand why the FBI declined to prosecute anyone on Clinton’s team, and I still don’t understand why the FBI clings to the notion that the prosecution had to prove criminal intent (the standard is gross negligence), but this much I do know — Democratic complaints about Comey’s conduct are absurd. He did her (and her team) an immense favor. “Regular” folks would have faced prison. Instead, Hillary and her confidants face the speaking circuit. Justice has not been done. What we witnessed on Wednesday was yet another validation of the appeal to Donald Trump's presidential candidacy (and subsequent election). That is, "regular folks" knew darn well they would never come close to receiving the same special dispensation as someone as high up in our Federal government as Clinton. Whether or not you believed it was wise for regular Americans to put their faith in Trump's assurances that such a thing wouldn't happen under his watch, there's little doubt that he struck a nerve with his "drain the swap" rhetoric. Ah, but the days of bipartisan comedy seem to be a distant memory. Apparently late night host Stephen Colbert's screed in response to President Donald Trump's tacky behavior towards CBS news guy John Dickerson is what passes for comedy these days. Because Colbert is no longer with Comedy Central, he can't use the excuse that he was merely "in character." No, Stevie is showing his true colors by revealing he's just another in a long line of show hosts who are little more than vile, smug leftist kooks looking to bring comfort to the thumb suckers still traumatized by the Trump presidency. Not to mention the likes of Colbert, Seth Myers, Jimmy Kimmel and Jimmy Fallon likely use their respective platforms for self-catharsis as well. In the end, I highly doubt there will be any repercussions from CBS regarding Colbert's "monologue." Apparently I'm behind the times because I'm being told by regular late night TV viewers that this kind of stuff has become almost commonplace. 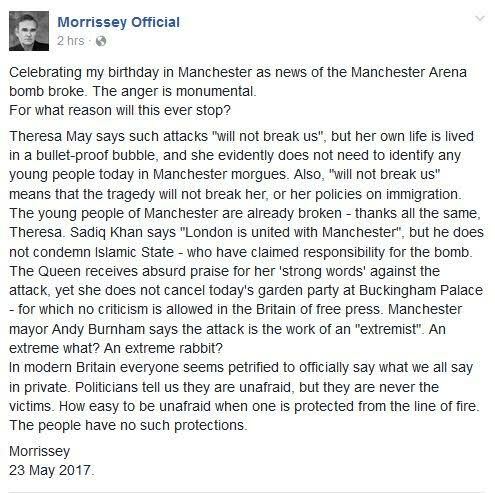 Hot Air's Ed Morrissey noticed this, too. Since Colbert is now free to be his true self, perhaps "Meet the Repressed" is more apropos. Editor 1: Wow. Our readers have absolutely lost their s**t over token conservative columnist Bret Stephens' first column with our paper. Editor 2: But why did he have to go there though? I mean, even the slightest insinuation that he questions **settled science?!?! ** Unconscionable! Editor 1: Look, it's water under the bridge. We just have to move forward and figure out a way to placate our traumatized readers as well as reach out to those who may have hastily canceled their subscriptions. Editor 2: Yeah, well to right this egregious wrong, we're really going to have to make a statement. Anyone? Editor 3: I know! How about a May Day column touting the virtues of a political movement which was responsible for the deaths of tens of millions of people worldwide? Editors 1 & 2: DONE! San Francisco Giants at St. Louis Cardinals - April 26, 1989. That time Giants outfielder Kevin Mitchell made a barehanded catch of a fly ball.